Saru Anime is a blog devoted to all things anime and manga, from news to reviews to articles on related topics. The owner, writer, and creator of Saru Anime is also known as Saru- an American with a lifelong passion for Japanese anime and manga. Of course, Saru is just a nickname. My real name is Angela, a graduate from the University of Central Florida with a BA in Creative Writing. I’m also a writer and editor for video game news website Operation Rainfall. Who is the character in your avatar? 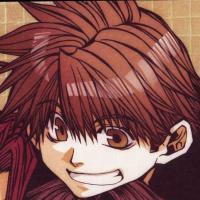 This little guy is Son Goku from the manga and anime series Gensomaden Saiyuki. Yes, he does have the same name as Goku from Dragonball Z– because both series are loosely based on the same Chinese epic Journey to the West! He’s often called “saru” or “bakazaru” by his travelling companions, and he happens to be one of my favorite characters. What does “saru” even mean? Saru is the Japanese word for monkey! I think that’s enough questions out of you, curious website visitor. Very good question! Unfortunately, it is the most mysterious mystery to ever mystify. Meaning I don’t know. But monkeys are cool anyway.